GC SoulCalibur II (USA) in 02:04.67 by N?K. 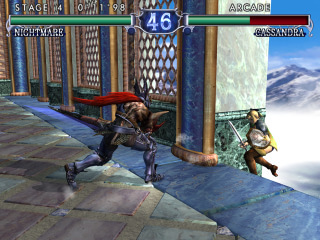 SoulCalibur II continues the tradition set by Soul Blade on the PlayStation and SoulCalibur on the Dreamcast with intense action and plenty of weapons to deal the massive blows. Each console version of the game also includes a unique character for the platform; in the GameCube version, it's Link from The Legend of Zelda. N?K improves his previous run by nearly a minute, thanks to setting the amount of rounds per match to 1 and overall better luck manipulation. Note: In order for this run to sync, the free DSP files included with Dolphin must be used. Playing back the run using DSP files dumped from a real GameCube will result in a desync. Note 2: Due to minor emulation issues, some fade transitions are completely missing, notably the transitions between matches in Arcade mode.